The Tetra Map model is an elegant and simple model that helps to facilitate transformational change for individuals, teams and organisations. It was developed in New Zealand by Jon and Yoshimi Brett. Our clients comment that the standout features are the simplicity of the concepts and the language, enabling wide application and use. 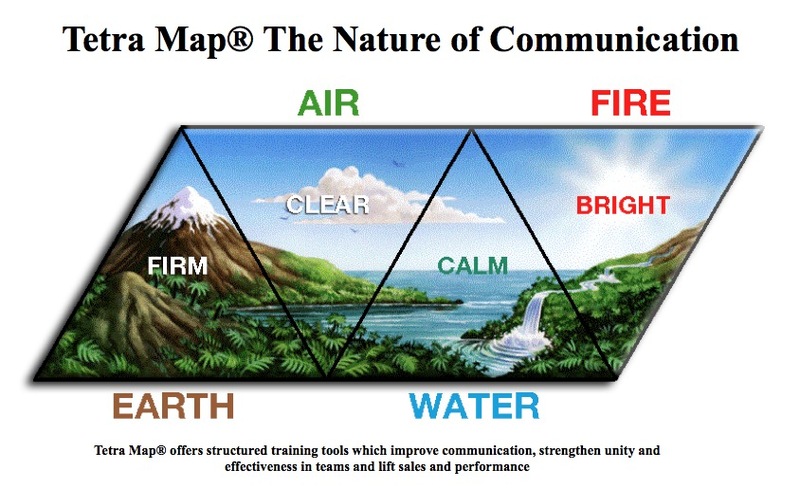 Tetra Map forms part of the content for our development programmes and team events. It provides teams with a shared framework to develop understanding, awareness and effectiveness. Tetra Map makes communication easy. It is a metaphor of nature and illustrates how Earth, Air, Water and Fire work together in synergy. It’s hard to imagine life or a sustainable environment without each one of them. Similarly, in human nature, we all have aspects of all four elements. Individual questionnaires and workbooks completed by participants in the sessions help them grasp the concepts and theory quickly. Personal and team insights gleaned in the session can be recorded in the workbooks and subsequently applied in everyday interactions. It helps us quickly notice the different aspects of nature within people and as a result develop more productive relationships and results.